Fall 1990, I had my first day at university. I have been an early adapter with computers. I had my first computer 1984 but i never had a windows computer. However at the university we did need a word program and a CAD program. Sure I could have used my Atari for this but neither our professors nor my colleagues had Atari but most of them (if they had a computer) had Windows with Word for Windows and AutoCAD 10. I switched again away from Windows when a friend and I started an advertisement agency. We used Macs and Ataris even if most of our clients had windows. In 1994 I was sure no real design company could work on Windows computer. We with Apple had Photoshop, Quark Express and Freehand. Windows had CorelDRAW, which we called a housewife drawing program. But when I joined in 1999 a bigger company (NEC), i had to use Windows again. I finally joined the corporate world. At this time and later most of my friends did buy Windows computers because they were used to them through work or bought them because it was important to have Windows and Office experience to get an office job or even a better office job. From the beginning Microsoft understood that the first time people will be confronted with computers will be at work. The mission from the beginning was to build a mass OS for companies, they saw that in the 80es the mainframe server-terminal configuration will die. Apple on the other hand had always the consumer in mind, they did want build an easy to use computer. The problem was that computers have been expensive and there was no Internet. Not everybody could afford a computer or did know what to do with a computer at home after a long day at the office. I believe, that Microsoft became the number one operating system for consumers was only an unexpected side effect. But it worked out. Because we used Windows and office at work, we decided to buy the same for home, we knew how it works and we could bring our documents to work to print or we knew we could share it with everybody. Computer usage got a necessity at work, did not matter what our profession was, in some way we most likely had to use a computer. Microsoft went further and did build and buy more and more enterprise applications. In the mid and late 90es the home computer got more and more introduced to younger people. The first generation had kids which have been now teens. And game companies started to build more and more games for Windows computers to attract the teens. At this time, game consoles were expensive and could not keep up with the speed. The first playstation from Sony got introduced 1994. But already a year later the graphics on the PC were so much better that it made sense to buy a computer instead of a game console to keep up with the rapid changes in speed and graphic. And then there was the Internet and AOL. In 94/95 we were able to use our home computer to read news, to talk to other people around the world. More and more people saw more sense in having a computer at home. The prices of the computer did not much go down but there were suddenly unlimited software for the consumer available. 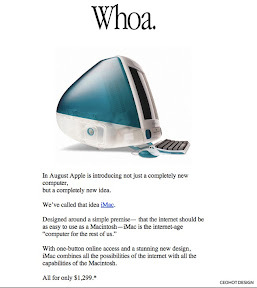 In 1998 Apple started a strategy which changed everything. I am pretty sure Steve Jobs was sitting 1997 on his back-porch and thought that it would be nice if computers could attract kids, the future working and decision making people. He needed to do something that children will influence their parents for the better of Apple. He knew the first contact with a computer is not anymore the enterprise world. It is in every house household. When Apple released the first iMac in 1998, they changed the way we look at computers. 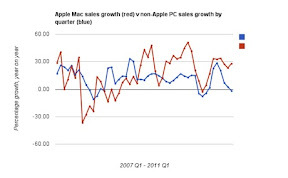 Not only was the iMac not as boring as Windows PCs but was as well priced closer to PCs than ever before. The iMac was priced $1,299 same price as an average PC with monitor. But there was an issue. Windows office was expensive on the iMac and there was not much common with the Windows UI. 2001 was the biggest most important step. Apple opened their first Apple store, totally designed to that whole families have fun. Parents can bring their kids to the store and can play at a round table on iMacs kids learning games. In the same year Apple started to sell the iPod and iTunes. A great music player targeted to young audience with an easy to use music library. The iPod was an instant success but computers are still not growing as good as they could. But Apple needed to understand a few years that beautiful computers don't sell if the user does not know how to use them. Apple introduced intel based imacs and bootcamp in 2006. Which allowed the user to install Windows on a Mac computer. This brought Apple closer to PCs. Consumers were now able to buy computers with beautiful design and still to run Windows on them. But at the same time the consumer is able to boot the Apple in MacOs. I don't know how many people did really buy an Apple and run it only in Windows, but the marketing was good enough that Apple finally found a bigger user base for their computers. In Fiscal Year 2007 (October 1, 2006 - September 30, 2007), Apple sold approximately 4,887,000 Macintosh computers. In this year Apple market share almost doubled. And from there on Apple grow each year faster than PCs. Of course it is easier to grow if you are an underdog. Apple started something in 1998 which got perfected in the last 4 years. A way to introduce a new system to the consumer of the future for a price same or lower than the competition. In 2007 Apple released the iPhone and iPod touch. The iPod touch is basically a mini computer with music player. A device we parents do not mind to buy our kids if they are asking for a music player, it would not hurt our pockets. In 2010 Apple extended the mini computers (iPhone and iPod touch) with the iPad. A tablet computer. For all three devices are now over 400k of applications available (smart move to have one place where we can find all apps). And because there are some many apps, Apple was able to sell over 200 million of their devices. Many of them are used by kids. Apple took it a step further. If every kid knows how an iPod touch, iPad or iPhone works, would it not cool if they could switch to a computer and it would work the same way? Therefore Apple introduced Lion and iOS 5.0. Two systems which got just closer. In only 2 years, there will be in the base functions no difference. Microsoft missed the step and was too much concentrated on the thing they are good. Game console and business. Unfortunate the xbox has not much in common with computers and what drove people to buy a PC will change in the opposite. There will come the time where businesses will choose what people are used to work with from childhood on. The biggest problem for Microsoft was and is the Internet. The Internet made it possible to run applications on browsers which are mostly OS independent. The cloud will even support web browser based applications. With the cloud it is not anymore necessary to have Office only to work as a desktop application. It will enable us to use it through browsers, like Google is already showing. I believe Microsoft will be more and more an important role in enterprise applications and DB but will lose extensive market share in PC or user OS. We will see a lot of Apple products in offices in 5 years. The question is were will google play a role in this? I can't really tell, Google has a potential to be a bigger player than Apple. But I doubt it will be in the office world. Google is too open. As an example, Linux might have been the better OS than Windows and even did run on PC and the best part, it was free. However support is difficult and there are not much applications on the market. Linux made it into the web server world because there you don't need tons of apps. Google has a similar problem, they have no experience with support and this will be their problem why they won't get fast into the office world. Apple on the other side has a lot of experience in support and offers hardware with software which allows them to have a more stable system, because they can build it against their specifications, they don't need to consider many difference form factors or hardware part to support.